The Bosch AquaStar Vertical Vent Kit (ES VVT) Steep is a through-the-roof stainless steel vent kit. It contains all of the stainless steel parts needed for a vertical installation EXCEPT for the 3" straight pipe, which is sold separately on this web site. 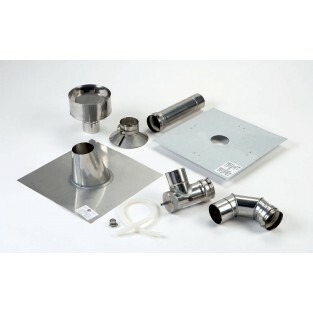 The ESVVT Steep Vertical Vent Kit contains the following 3" Z-Flex Z-Vent stainless steel vent parts: a 90 degree elbow, a 12" straight pipe, a vertical condensation drain tee, a 24" condensatiion drain tube kit, a fire stop support, a STEEP adjustable roof flashing (7/12 - 12/12), a top support/storm collar, and an extreme weather rain cap. High temperature sealant is needed to seal the top support and is NOT included in this kit. The high temperature sealant is sold separately on this web site. This Vertical Vent Kit is designed to work with the Bosch Therm 940ES, Bosch Therm 830ES, Bosch Therm 660EF, GWH 715ES and Evolution 500 as well as the Bosch AquaStar 2700ES and 2400ES heaters.